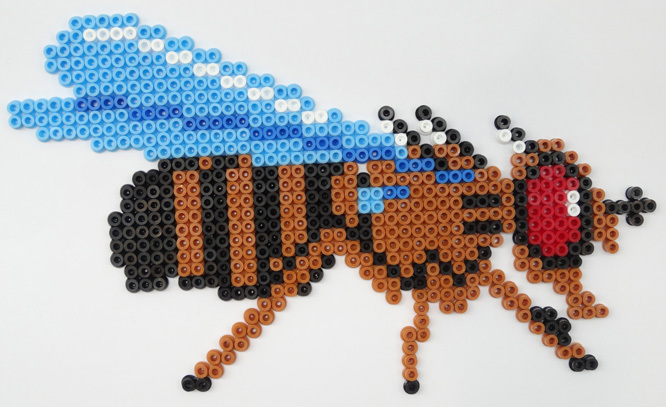 Hama bead fly. Made by Andreas Prokop's son Lucas following the patterns mentioned in the text. There is some evidence, however, that there has been a downturn in NIH and NSF funding for Drosophila research . One explanation for this could be the worldwide political trend of reducing funding for basic science in favor of providing funds for more translational research — in an (arguably false) expectation of short-term returns on tax investments. Unfortunately, this strategy ignores the role fundamental biology plays as the lifeblood for translational research. A trend of decreased support for basic science may well have the opposite of its intended effect, gradually and eventually drying up the production line that feeds advances in biomedical application. What can fly researchers do to address these issues? I would argue that education, science communication, and outreach initiatives are some of the most critical tools we have for maintaining a robust Drosophila community that can continue its important contributions to biology and biomedical research. In this blog post, I describe some existing outreach initiatives, and discuss what more we can do. Ironically, despite the threat of decreased funding, Drosophila research is needed more urgently than ever, as “omics” approaches in human genetics release a flood of disease-linked genes — which are more often black boxes than known entities. Established model organisms like Drosophila will be key to understanding these genes and testing hypotheses about them quickly and efficiently. Fruit flies are also powerful tools for facing other challenges generated by “omics” data and new technologies. The fly’s efficient combinatorial genetics are ideal for validating and understanding gene networks, and Drosophila can readily serve as an experimental pipeline to help iteratively build and test computational models [e.g. 4]. While flies are clearly not mini-humans, and there are limitations to using Drosophila for studying human diseases, Drosophila has a proven strength in pioneering research into unknown territories. Using efficient and cost-effective research in flies to explore these genes is a responsible and low-risk investment, and countless cases from the last decades have shown us that this investment pays off: knowledge gained in flies frequently inspires and enormously accelerates advances in mammalian and human research. This has been well documented in the article by Hugo Bellen and colleagues: “100 years of Drosophila research and its impact on vertebrate neuroscience: a history lesson for the future” . Does the community of drosophilists do enough to communicate these benefits of fly research to the general public, including politicians? We tend to be so occupied with our scientific activities that public communication of our work is easily overlooked (or intentionally sidestepped). At the outreach workshop of the last GSA Annual Drosophila Research Conference in Chicago, Allan Spradling also commented that fewer members of the public, especially the younger generations, seem to have encountered Drosophila in schools. I observe the same at museum events, where those who were taught about flies at school even decades ago, tend to respond with noticeably greater curiosity and interest about fly-related topics than those without such memories. Traditionally, flies were used in school lessons to teach classical genetics, but the enthusiasm for this strategy seems to have been widely lost. As a consequence, I notice that first year university students often have little appreciation of, and even a disregard for the usefulness of invertebrate model organisms. We can hardly blame them for this. On occasion, I wonder whether even our fellow scientists and clinicians are sufficiently aware of the opportunities fly research offers. Clearly, science has moved on. Drosophila was once unrivalled in its status as a “boundary object”, i.e. a model in which genetic strategies could be used for the investigation of biological mechanism (for an enlightening article on Drosophila embryos as boundary objects, see ). But as the genetic methods for other organisms have substantially improved over the years, Drosophila now shares this key role with other important models (and even culture systems). The advent of CRISPR technology will further contribute to this trend. Arguments for supporting fly research are therefore less black-and-white than in the past, and need to be substantially refined. We need to creatively, but sensibly, highlight the speed, efficiency and cost-effectiveness of our research, as well as the depth of conceptual understanding, the high degree of genetic and mechanistic conservation, and the unique opportunities for newly arising research directions. What can be done to address these issues? More than a decade ago Christian Klämbt started the visionary “FlyMove” project, a site dedicated to illustrating and explaining Drosophila developmental biology in simple terms, aimed at university students and teachers of developmental biology. Increasing numbers of school or university lessons are being published, as well as ideas for science fair displays (some examples). Bethany Christmann‘s blog “Fly on the wall” is an outstanding initiative to explain in lay terms trends in Drosophila. Originating from her participation in a 2011 workshop on Drosophila Neurogenetics (organized by Lucia Prieto-Godino and Sadiq Yusuf in Uganda), Isabel Palacios runs an increasingly successful series of Drosophila workshops in Africa. Together with the development of the TReND in Africa organization, which developed from the same workshop [LINK1; LINK2], these initiatives are successfully seeding an African biomedical research community which also capitalizes on Drosophila as an affordable model organism. Two entertaining films about Drosophila, “Small fly, big impact” (part 1 & part 2), which have proven popular and valuable online and in schools. Free-for-download lesson plans and the droso4schools support website, which grew from an initiative to establish flies as modern teaching tools at schools (for more see here and here]. Thoroughly tested approaches for multi-stand science fair displays; for example a successful neurobiology fair where Drosophila researchers joined ranks with mammalian neurobiologists and neurosurgeons. Novelties for engaging young children, such as Hama bead patterns (PDF). These can also be used for science fair flyers that children can take home, ideal for using a “Trojan horse strategy” , in which we provide web links to lay resources on Drosophila that parents can investigate. The twitterbot @fly_papers, set up by Casey Bergman to provide an easy means to stay up-to-date with the fly literature . This information pipeline has recently been joined by Thomas Brody‘s new twitter feed @interactivefly. The Drosophila genetics training package  including the “Rough guide to Drosophila mating schemes” , developed for training newcomers to fly research, is now being used worldwide. Strategies to implement this training package in university courses, including flexible methods to electronically assess learned skills (see below). Unfortunately, the third aspect, i.e. coordinating outreach activities within the Drosophila community, is presently difficult to achieve, and, as a community, we need to develop better means of communication. The visionary idea of the Drosophila Information Service to spread the word within the community and share good practice  needs to be translated into modern communication technologies, which can be as simple as a moderated newsfeed. Another strategy is to increase the visibility of existing materials. To this end, the Manchester Fly Facility has developed a website, complementary to FlyBase and The Interactive Fly, which provides a one-stop-shop for Drosophila science communication resources, also including growing lists of lay articles and material about the history of Drosophila research. For our efforts to have profound effect, we need long-term strategies. One such strategy is to give flies a stronger prominence in biology school curricula. This strategy also has a lot to offer to schools. Flies provide exceptionally good conceptual understanding of biology and bring countless opportunities for exciting, low budget experiments with live animals that reflect contemporary research (see the droso4schools website). Another long-term strategy is to increase Drosophila teaching of university students. This audience is unique because they are non-expert members of the general public but are also potential future scientists. For example, to address the “general public” side of students, we can adapt the Drosophila resources developed for schools. In my experience, starting at this fundamental level is a good way to engage university students. To address “future scientists,” the fly genetics training package we described in G3  offers great opportunities. Introducing students to the core strategies and concepts of genetic model organisms like Drosophila. Reflecting relevant training that students can directly apply if they choose to join a lab working with flies or other genetic model organisms. Improved learning by teaching the fundamental concepts of classical genetics in an integrated and applied way. Providing training in strategic thinking and representing active learning at higher order, both desirable goals in university education. Flexibility; it can be used either as a stand-alone unit or integrated into courses on other subjects, including genetics. Incorporating the module into genetics courses provides a potent means to address critical comments by Rosemary J. Redfield, who pointed out a need to change the focus of genetics courses away from classical topics and towards state-of-the-art molecular, genomics, and “omics” approaches . Embedding the Drosophila training module in a genetics course alongside other modern techniques will ensure that basic classical genetics is taught in an efficient way that leaves space for other topics. The feasibility of this approach is demonstrated by our annual developmental genetics course at Manchester, where the fly genetics training has been successfully integrated . Cartoon made using the Genotype Builder tool provided as supplement to Roote and Prokop (2013). This developmental genetics course includes up to 65 students. Assessing such large numbers for mating scheme design skills is not trivial. To make assessment more feasible, we developed a hybrid strategy, in which students solve a mating scheme task first on paper, and the solution is then queried using standard multiple-choice or multiple answer e-assessment questions. As explained in our G3 paper , this method combines the advantages of paper-based and electronic assessments, so that exams are more fair, and provide the flexibility to assess a wide range of knowledge and skills, including virtually every aspect of mating scheme design and the underlying classical genetics, as well as the ability to translate between genotypic and phenotypic levels. As we point out, this strategy is not only suitable for genetics, but could as well be applied other disciplines requiring complex problem solving, such as mathematics, chemistry, physics or informatics. We used this assessment in three consecutive years, and have observed a reliable and realistic spread of marks that clearly highlights the stronger candidates. We are therefore confident that in-place strategies can be used to teach and assess Drosophila mating scheme design even to large cohorts of university students. Since the strategy is based on an interactive, interesting and unconventional method that engages students, it hopefully leads to a long-lasting and better appreciation of the usefulness of model organisms. Drosophila plays a key role in the current research landscape, and there are many areas in which the fly can make major contributions in the future. But there are alarming signs that funding trends might not favor invertebrate model organisms. Better communication and active outreach is urgently required to address this trend, ideally making use of long-term strategies. Here, I have tried to provide an overview of the ways in which this can be achieved, hopefully inspiring more researchers to join in. As I have argued in an another blog post, scientists themselves can learn a lot from engaging with the public. In my own experience, outreach has helped enormously in developing better arguments and ways to communicate my research, and this has turned out to be extremely useful for grant applications and publications — all in all, a win-win situation! Kohler, 1994, Lords of the fly. Drosophila genetics and the experimental life, The University of Chicago Press. Brookes, M. (2002). Fly: The Unsung Hero of Twentieth-Century Science. Phoenix. Wangler, M. F., Yamamoto, S., & Bellen, H. J. (2015). Fruit flies in biomedical research. Genetics, 199(3), 639-653. doi:10.1534/genetics.114.171785. Shimizu, H., Woodcock, S. A., Wilkin, M. B., Trubenová, B., Monk, N. A., & Baron, M. (2014). Compensatory Flux Changes within an Endocytic Trafficking Network Maintain Thermal Robustness of Notch Signaling. Cell, 157(5), 1160-1174. doi: 10.1016/j.cell.2014.03.050. Bellen, H. J., Tong, C., & Tsuda, H. (2010). 100 years of Drosophila research and its impact on vertebrate neuroscience: a history lesson for the future. Nature Reviews Neuroscience, 11(7), 514-522. doi:10.1038/nrn2839. Keller, E. F. (1996). Drosophila embryos as transitional objects: The work of Donald Poulson and Christiane Nüsslein-Volhard. Historical studies in the physical and biological sciences, 313-346. Sumner, J., & Prokop, A. (2013). Informing the general public about cell migration-an outreach resource. doi: 10.6084/m9.figshare.741264. Gibney, E. (2014). How to tame the flood of literature. Nature, 513(7516), 129-130. doi:10.1038/513129a. Fostier, M., Patel, S., Clarke, S., & Prokop, A. (2015). A Novel Electronic Assessment Strategy to Support Applied Drosophila Genetics Training on University Courses. G3: Genes| Genomes| Genetics, 5(5), 689–698. doi:10.1534/g3.115.017509. Redfield, R. J. (2012). “Why do we have to learn this stuff?”—a new genetics for 21st century students. PLoS biology, 10(7), e1001356. doi: 10.1371/journal.pbio.1001356.